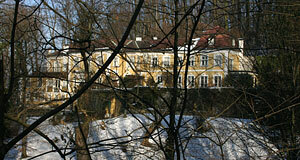 The Zweig Villa on the Kapuzinerberg Mountain was built in the late 17th century and is named either after the writer Stefan Zweig ("Zweig Villa"), or Anton Paschinger ("Paschinger Schlössl"), who owned the building between 1824 and 1867. Stefan Zweig is without doubt the more significant person in the history of the building. After the end of World War I, the Viennese (though cosmopolitan) writer, scholar and pacifist purchased the villa in 1919. Here he lived until he emigrated to England in 1934. The building consists of three floors and is directly built to Salzburg′s old city walls. It was re-modelled and extended in the 19th century. Today, it is private property, but clearly visible from the entrance area of the Kapuziner Abbey - just not in summer, as you can see (or rather cannot see) in the picture above. There is a memorial of Stefan Zweig next to the abbey. Being Jewish and a heart-felt European, he committed suicide in Brasil collectively with his wife in a moment when he believed that Europe was lost to the Nazi terror.